There are many ways to hide ourselves from others. We can use humour, sarcasm, anger, shyness, gossiping, isolation, work, money, drinking, or just generally being guarded with your thoughts and emotions. NO MAKEUP? WAS SHE INSANE? I didn’t want to expose my ugliness to the world. I felt safe in my makeup. Protected. What if people saw the real Tina? That was a scary thought! No, I couldn’t fathom it. She gave me a challenge to not wear any makeup for 2 weeks, so one day, very scared, I tentatively walked out of my house with no makeup on. I walked the couple blocks to downtown and no one pointed. No one told me I was UGLY. No one even looked at me funny. In fact, it seemed no one cared! Often times we hide ourselves from the world but the world has their own problems, their own issues to deal with and so the world doesn’t really notice! The world doesn’t pay attention to whether I am having a good hair day or bad hair day. I’m the one who puts all the importance into that detail. If no one is paying attention to the degree we think they are; WHY ARE WE HIDING? We feel hurt in some way and that brings on the behaviour. I had a negative belief system in place where I thought I was this horrible, ugly, terrible person; however, that wasn’t what the rest of the world saw when I walked down the street. They saw a 26 year old woman who looked totally fine! 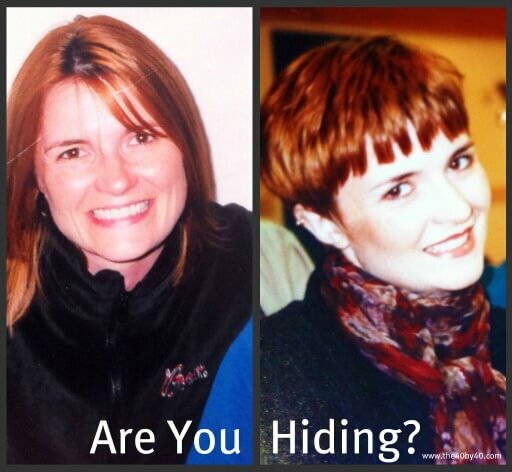 If you are hiding, ask yourself WHY? Why are you limiting your life in this way? With my makeup example, I couldn’t just dash out of the house and meet a friend for coffee if I wasn’t perfectly manicured. My belief system of thinking I was ugly and, therefore, needing the makeup, totally limited my life and my relationships! Are YOUR relationships being affected? Are you holding back because you might get hurt? Do you TRUST your INSTINCT enough to make the right decisions for yourSELF? When you hide, you aren’t honouring your true SELF. You are dimming your LIGHT. You are dimming your LIFE. Please don’t dim your light. Don’t hide from us. We may not see you now, but we will definitely see you if you allow yourSELF to shine. By honouring your true SELF, your CORE, your SPIRIT you will find your JOY. When you find your JOY, you will be hard to miss! You will glow, radiate and have an energy that is undeniable. There lies the gift; the gift of YOU! PS. 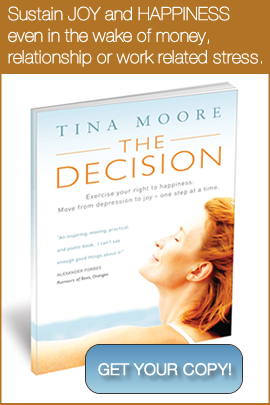 THANK YOU for passing on the information about my book, “The Decision”. I’m passionate about spreading the word on how to manage depression and anxiety and find your JOY. If I can do it, anyone can!